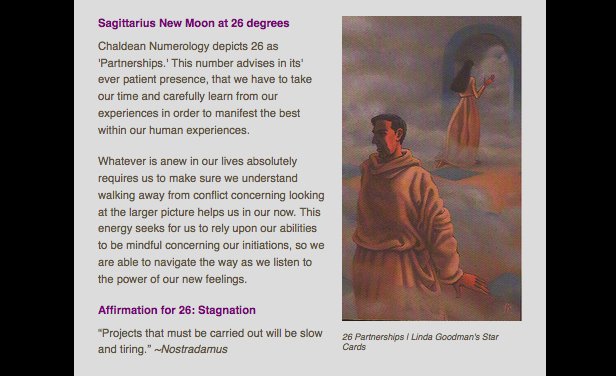 Waxing Phases favor actions involving planting anew and moving forward, as energy increases throughout one half of your Zodiac Pie from 26 degrees Sagittarius (the 3rd New Moon of a series of 5 that will fall at this patient degree point), Capricorn, Aquarius, Pisces, Aries, Taurus and Gemini until the next Full Moon at 11 degrees Cancer 01 January 2018. This final New Moon of Autumn as well as 2017 is riddled with extremely restless energy that wishes to fight and rebel, yet is equally restricted. Whilst the urge for freedom and the pursuit of the truth will be absolutely favored, the practice of patience is the only responsible way to work with allowing it to come out. The necessity to filter not only what will be intensely distracting in our outside world, but careful consideration will be required with the one we have personal control over. Walking away from any argument will be more than advised to navigate this erratic energy with success verses frustration. Your philosophies have been under the reflective microscope with mysterious changes, as education and spiritual pursuits find you journeying afar to take time to honor your own growth. New truths are more than important right now, seeking for you to find peaceful means to appear different to the world. Your most regenerative new moon of the year is here with a spiritual rebirth concerning your overall state of prosperity and sexuality. Your source energy has recently been sorting through feelings to allow you to truly understand wealth is not just about the money, which still requires your time in solitude. As you have been in serious contemplation this month concerning your business or personal relationships, it is more critical than ever to listen intently to them and seek to understand before begin understood. Your observation of others holds important keys to strengthen what the future holds. Learning new ways to enhance your abilities to serve your physical self and others, your health, and habits has been your ultimate responsibility under Mercury Retrograde. As you have discovered how much your routines have now become renewed, you witness your career is an essential part of this process. Energetic feelings have not left you as reflection concerning your children or brain-children has captured your attention. Life upon your stage is keenly perceptive to provide the answers for you to recharge your creative flow, yet the missing link you’ve been waiting for involves shocking changes for your beliefs. Don’t doubt that all the contemplation surrounding your home, family and closest environments hasn’t served a purpose you needed to understand for the better. Listen carefully to what déjà vu messages have to say. This is a very intense time of surrendering to the past, and allowing yourself to embrace rebirth. Your state of mind and how you choose to express what’s on it have been under the watchful eye of reflection. Moving forward, it is time to instill the habit of positive thinking and be assured that this practice is going to dramatically affect what you are meant do next with your business and personal partnerships. If you have spent time in recent weeks focusing upon what needed improvement concerning your earning power, your keen observation has been important to listen to. Value you can rely upon now asks for you to involve your service to self and others, and accept the unexpected will make abrupt changes. There have been all kinds of ways your approaches to life have been in a complete state of examination, and now the world notices a distinct change in your appearance and attitude. As you connect the dots to what needs to shift in all matters concerning children and creativity, you find resolve. Time in the silent listen has recently unfolded rewards to help clear the past if you have honored your solitude. Answers subconsciously speak now from your inner world. Review your dreams to understand your waking life, as surprising revelations help you nurture your home and family life for the better. If you have been observant of your future goals along with aligning what needed review concerning your hopes, wishes, new friends, organizations and groups you’ll now move forward with clarity. Accept any unexpected invitations to mix and mingle, and enjoy the unusual conversations you like to have. As your career has been under the reflective microscope, the recognition and reward you have been waiting for now seeks to place your public life back in the spotlight as all eyes are upon you. There will be a reinvention involving your earning power that surprises you in the renewed value it can bring.